On Friday night, Zac Efron tweeted the movie trailer for Extremely Wicked, Shockingly Evil, and Vile. The film stars Efron as notorious serial killer Ted Bundy. But look closely at the trailer and you might see some familiar spots. 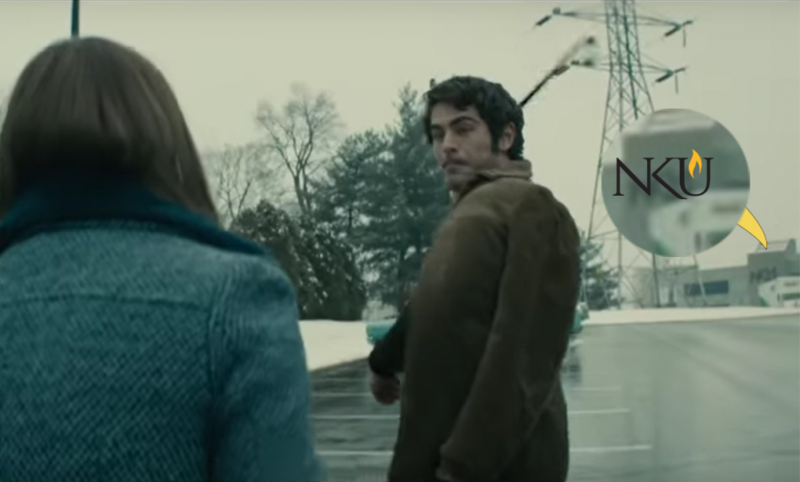 In one of the shots, you can see Efron hitting his castmate with a crowbar; yet in the background, you can see the Steely Library’s NKU logo. Several scenes in the trailer are in the library itself. Toward the end of the trailer, Efron busts through the front doors of Steely. Efron came to campus on Feb. 17 of last year. Many students hunted for a moment to see the star, yet none have an experience like this investigative journalist. Let me flash you back to my experience looking for Zac. The day began as any other snowy Saturday. 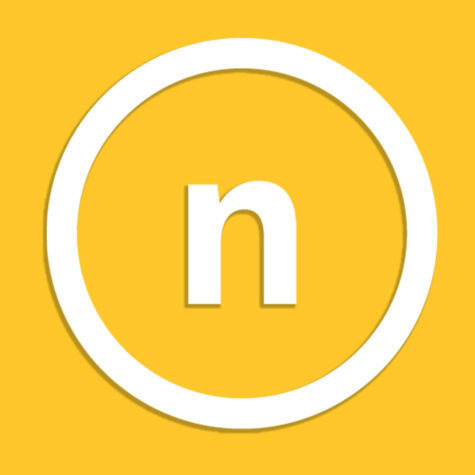 I woke up on Feb. 17 and went to Norse Commons for breakfast. I sat and ate alone. I lingered thinking on what I had to do that day: take photos for a friend. In that moment, I remembered that my Presidential Ambassadors’ advisor had told me all of Zac Efron’s potential sets on campus. I was told Nunn Hall’s mock courtroom, the law library and our own Steely Library were all potential sets. Daniel and I then herded our friends and began our trek to our first stop. On the journey, the snow started coming down even harder and it covered car windows driving through campus. Our group began bubbling over with theories that Zac was in the cars being transported from building to building to protect him from students (such as ourselves). As we arrived in Nunn Hall, we saw moving trucks loading set pieces and costume racks into the building. We entered the building’s northeast stairwell and immediately saw people in black outfits lounging in the law library. Sadly, the door was locked. So, we stared at them, very intensely. While staring, we saw the renovations to the law library. The people, who were trying their hardest to ignore our very loud pleas that was only boosted by the reverb of the stairway, were obviously not students. After a few minutes of staring and pleading for them to open the door, we decided to investigate the rest of the building, for if there were cameras, there too should be Efron. We ran through each floor with nothing to see other than the off-white walls of our law building. Until we got to the fifth floor, where we caught a whiff of something. Something more pleasant than the breakfast we had at Commons. We started pacing up and down the halls when we found a sign that read ‘CATERING’ pointing down the hall. The smell became more and more prominent as we started running after it, until it disappeared. Shortly after we found a stack of empty pizza boxes from Toppers, still unconfirmed if that was the food they were enjoying. We began going back to the stairways. There was a group of girls in the stairway and our group relayed the information that we had learned thus far. We conveyed to them that the second floor was locked. I then suggested that they take the elevator to the floor and see what they can find. We sent them on their way from the third floor and down the elevator. I haven’t seen those girls again since the door shut. Our group became hopeless that we would not come across the star. We recruited Jake Wietmarschen (the one and only) to help us along the journey. Jake told us that he had an in with someone that could get us to see Zac Efron. Unfortunately, my group decided to split. I walked with Jake, Daniel and Paula Marie Gagne to the library, his rumored second location. On the way there, we ran into Christian Dichoso, who had an internship with NKU Police who were supervising Efron’s day. We knew that meant yes. The five of us decided to sit, rest and warm up for a bit before we continued. I, however, had to run to my Norse Hall room to charge my phone and also prepare for the photoshoot I had coming up. So I left the group to charge my phone and grab my backpack. After about 30 minutes, I headed back to the library. My friends were nowhere in sight. I snapchatted Daniel asking where he was. I then found them in the parking lot I, across from the Library. I walked up to them past the cop cars and semi-trucks, and they took a step away from the set. The set was a teal Volkswagen bug and white sedan with a white tent nearby. They explained that they were told for every person that arrives they have to take a step back. Shortly after, a man strolled to our group of five. He told us he is in the assistant director’s circle for the film and explained that he was fine with us watching the scene. However, he advocated that we move to find a better angle, pointing to some places in the lot that would be clear from the shot of the camera. He also asked us to not post any pictures we take of Efron and to remain quiet wherever we go. “[Efron] is just in a such a state that if he comes out of it, he won’t be able to go back,” he said. Christian left our group as we migrated down to Jake’s car to watch the scene unfold. There we saw Zac swinging his crowbar—the same clip from the trailer—and he saw us. I left halfway through the scene’s filming to do the photoshoot in the School of the Arts. As I walked out of the Greaves Hall exit, I saw bright lights and strolled all the way through the library’s culdesac. Sadly, after being removed from the hunt for an hour, I forgot Zac was even on campus. It wasn’t until I turned around and saw the cameras that I remembered that Efron was filming there—and I wouldn’t be surprised to find myself on the special features of the DVD.